Today, we’re celebrating the arrival of a six-pack of large concrete tunnel pieces that are intended to become a well-used passageway for frogs and salamanders under Highway 4. 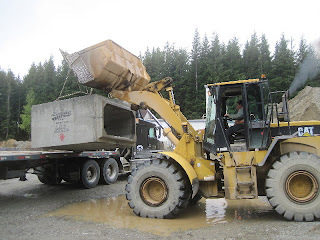 Langley Concrete and Tile Ltd cast the box-shaped structures that will fit together to form a 13.5-m long tunnel under the highway. There are five and a half pieces to join. Each full piece measures 2.2 m wide, 1.3 m tall and 2.4 m long, and weighs over 7 tonnes. The sixth piece is half the length and weight of the others. It took a mighty machine and skilled operators to lift the pieces off the B-train transport truck. Using chains and specialized hooks, called “clutches”, a front-end loader carefully moved each piece to where it will be stored until installation happens later this spring. “Why concrete?” you ask. Indeed, it is heavier and more expensive to make and move than plastic or metal. It has advantages, though, when it comes to providing a spacious passageway under a shallow road-bed. Concrete is strong enough to hold up traffic (literally!) with only a small amount of material covering it to the road surface. While the transport driver watched the off-loading, he described his step-daughter’s excitement about him delivering a tunnel for frogs. “She loves collecting frogs, identifying them and writing about them in her journal”, he said. A budding herpetologist, no doubt. 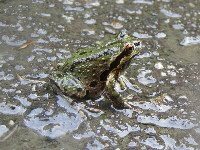 We invited him to bring her along next September to see the frog migration and the new tunnel in action.